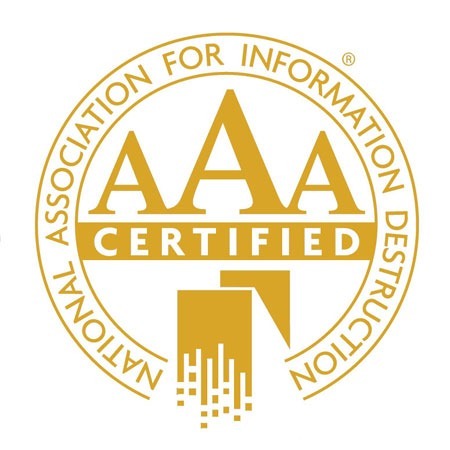 On December 5th, 2017, 3R Technology was approved as NAID (National Association for Information Destruction) AAA-Certified for our secure hard drive and media destruction services. This is yet another assurance of how seriously we take our commitment to the guardianship of our clients’ sensitive information. The NAID AAA Certification Program is a voluntary program for NAID member companies providing information destruction services. Through the program, NAID members are audited for mobile and/or plant-based operations in paper or printed media, micromedia, computer hard drive destruction, and/or computer hard drive sanitization. Audit Quality – All NAID certified service providers are subject to regularly scheduled, onsite audits by trained, accredited security professionals. In addition, random, unannounced audits are structured so NAID certified operators will not know when they will be audited next. Regulatory Alignment – The program requires written policies and procedures for each company to ensure incident response preparedness, employee training, and regulatory compliance. A customer may request an audit report to monitor the service provider and to ensure they meet the regulatory risk assessment requirements. Security Specifications – Accredited auditors review employee background screening and training, compliance with written procedures, access controls, operational security, destruction equipment, and confidentiality agreements. Provide Audit Report – A customer may monitor compliance by subscribing to email notifications of the service provider’s certification renewal, audit, or lapse. Transparency – All documents and specifications are available to the public for free and online. Audit reports and monitoring services are also provided to clients at no charge. The association’s financial records and board of director’s meeting minutes are available online as well. Program Acceptance – More than 1,000 operations on five continents are certified by NAID, including mobile, plant-based, paper, and computer destruction services. NAID certification is required by hundreds of government offices and thousands of private contracts. Oversight – The Certification Review Board and the Certification Rules Committee oversee the program’s integrity, both of which contain industry veterans and outside, accredited professionals. Program Recognition – NAID certification is acknowledged by many accreditation programs, such as those offered by the International Association of IT Asset Managers, the Institute of Certified Records Managers, and the R2 IT asset recycling program certification offered by the Sustainable Electronic Recycling Institute (SERI). Complete information can be found on NAID’s website.